The amount of data and stunning imagery being delivered by NASA’s Curiosity rover has given us new insight into Mars, but a new concept vehicle for future missions could dramatically increase our knowledge of the red planet. 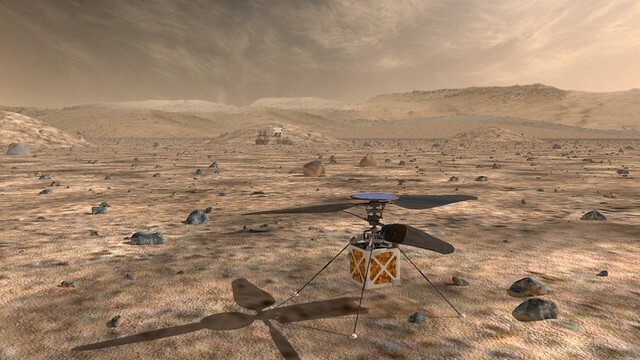 NASA is gearing up to create a robotic helicopter that can serve as a scout for more traditional, land-based rovers. Pics: What If Earth Had Saturn’s Rings? The Mars Helicopter would be able to travel up to three times the distance that either rover can travel in a single Martian day, along with pinpointing new locations for the rovers to explore. Weighing 2.2 pounds with a diameter of 3.6 feet, the Mars Helicopter would be visually comparable in design to some consumer-grade drones, but would likely be equipped with far more advanced equipment to allow it to communicate with the rover. Additionally, the drone would have a top-mounted solar panel, allowing it to charge itself as it travels over the surface of the planet. During an episode of JPL Engineering, NASA engineers talked about their plans to introduce the “Mars Helicopter,”. “You might think it’s actually easier to fly one of these helicopters on Mars because it’s actually three-eighths the gravity we have here on Earth, but it’s 100 times less atmosphere,” explained Mike Meacham, a mechanical engineer with NASA’s Jet Propulsion Laboratory. Meacham went on to explain that, traditionally, the lift generated by the rotor blades of drone helicopters comes about from the density of the Earth’s atmosphere. Without this high density atmosphere, the rotor blades would need to spin much quicker to generate the same lift. The space agency is currently testing the prototype versions of the Mars Helicopter and it has been marked as an “add-on” to future rover mission. This implies that even if the helicopter gets approved, it will not be flying soon. Bottom line: NASA has plans to return to Mars in 2020 with its next mega-rover in an attempt to bring Martian rock samples back to Earth. The Curiosity-style mission will actually collect and store samples for a future mission to bring back. Scientists and engineers are looking at possible landing sites, like dried up lake beds or deltas—places that would have been suitable for life.